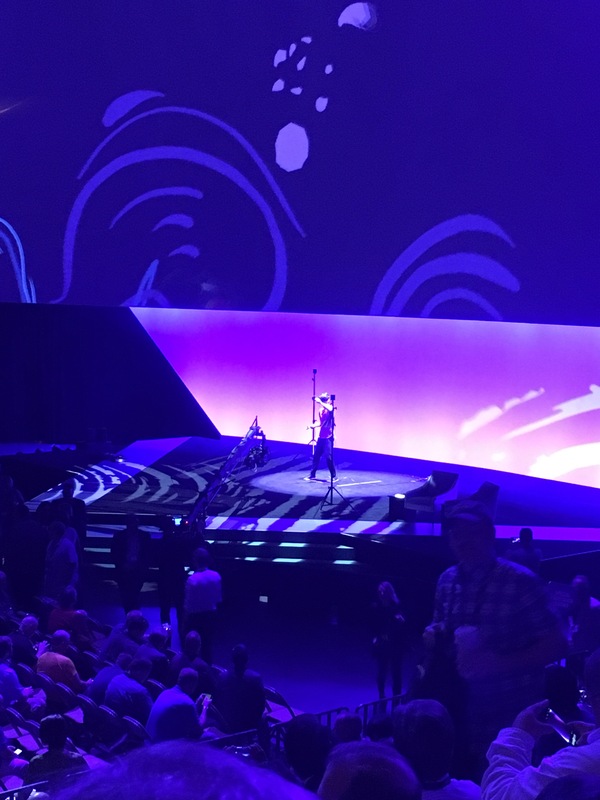 The theme for the second keynote could be described as storytelling, but it all started with Pat Gelsinger and Michael Dell answering a few questions from the VMworld attendees. Questions ranging from support issues to whatd does the future look like. However, going back to the storytelling. In order to provide us in the audience a sense where all products fit in, we were presented with a ficticious company called Elastic Sky Pizza (with a nod back to the past in the name) that were having some issues. With the VMware portfolio quickly becoming filled to the brim with products I think it was a good approach to talk us through the solutions and products used and at what stage they were used to solve Elastic Sky Pizza’s problems. And a few new products and updates were also annonuced such as Horizion version 7.3, Pivotal Container Service, Workspace ONE and Horizon Cloud. At stage Pat Gelsinger today annonunced new cloud services but amongst others but the most interesting announcement made was AppDefense a technology that will help us stop chasing bad and instead ensuring good as Pat Gelsinger put it. AppDefense will basically learn how the applications work in your virtual machines and create a manifest that will be used to protect the applications from doing things it’s not supposed to do. And today VMware Cloud on AWS as an offering is available. Will be really interesting to see the adoption rate. VMware Cloud Foundation is update to a new version. All announcemnts can be found here. A short summary of the day: Sunday, the day before the big event, is dedicated to partners. I spent the day in really interesting sessions ranging from vSAN Networking design to NSX selling. A all sessions were informative and exciting, the one that had the biggest impact on me was a session called NSX assessment led selling. Now I’m really looking forward to the main event starting tomorrow. I arrived yesterday and VMworld started today for me as I’m working for a VMware distributor I attended a bootcamp focusing on vSAN. The core of the session is to enable partners to achieve the VTSP certification (a pre sales certification) but a was more of an open discussion with some of the greatest minds on vSAN. james LeFort, Jeff Hunter, Pete Koehler, John Nicholson amongst others. It was a really great session, a lot of topics were discussed – high and low. A huge boost of confidence in vSAN. Summing it all upp, it was a great start to VMworld and I’m now as excited as ever for the main event, but tomorrow will be some additional partner training before VMworld starts on monday – should also be fun! A few days ago VMware Education released a brand new series of exams with the badge name “Specialist”. Currently there are two exams available, vSAN 2017 (called 2VB-601 in official certification lingo) and vRealize Operations 2017 (2VB-602). I do like a good challenge so I scheduled the exam basically as soon as I heard about the exam and started preparing for it immediately – I basically only had a days worth of preparation due to the fact I wanted it done before heading out to Las Vegas and VMworld 2017 (but I’ve been using, talking and writing about vSAN for quite a while) . You can read more on what’s expected of you before scheduling the exam here. But in short, if you hold a valid VCP6 for any solution track you can just schedule the exam. So how did I prepare for the exam? Well, as I already mentioned I’ve been using vSAN for a long time but more recently I attended the instructor lead vSAN class in April without knowing that there would be a certification introduced just a few months later. The class I attended was called VMware Virtual SAN: Deploy and Manage [V6.2] and as you probably guessed already based on the name was focused on vSAN version 6.2. So now I have access to the official “Student Lecture Manual” that goes along with the class, obviously that’s a good starting point as far as studying goes. To get up to speed on the latest version of vSAN I really recommend heading over to #vBrownBag and catch the episode called VMware vSAN 6.6 Deep Dive with Jase McCarty. And for some hands on experience I’d recommend the VMware Hands On Labs (free of charge – thats just fantastic, thanks VMware!) where you can find lots of labs and a few vSAN related labs as well. Or if you have a home lab I would really recommend William Lams automated vSphere Lab Deployment – I use it all the time and it’s nothing short of amazing! Another great resource is of course the VMware SABU (Storage and Availability Business Unit) team’s resource page for technical documentation called storage hub. Two documents I found useful were called “VMware vSAN 6.5 Technical Overview” and also the latest version “VMware vSAN 6.6 Technical Overview”. Don’t forget to read through the exam prep guide either. It’s the exam blue print stating all the topics that will be covered on the exam. Quite important. The exam itself consist of 60 multiple choice type of questions. You’re allotted 105 minutes to complete the exam with an automatic 30 minute language extension, and that should be more than enough time to complete the exam. I tend to do exams rather fast, but I spent roughly 45-50 minutes on the test including reviews. And as always, when you click to end the test it takes a few seconds to understand and have it sink in if you passed the test or not. 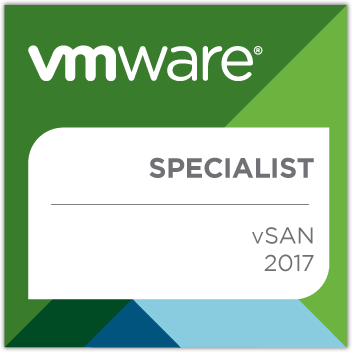 And I did, so now I’m officially not only a vExpert vSAN but also a VMware vSAN 2017 Specialist. Woho me! After the first episode of my “How and why”-series in which I talked about VMware VSAN I thought it’d be fun to show you why I love Veeam so much and in particular the function SureBackup. SureBackup is all about verifying your backup data (your VMs) in a super smart way. The bottom line is, if you need to restore anything you KNOW that the restore will work. Again, the video is in swedish only. Through out the years I’ve always believed that blogging is a great way of sharing information. I’ve followed lots of blogs for my own learning process (too many to mention but a huge thanks to all my fellow bloggers) and enjoy reading high level posts as well as deep dives. That’s the beauty when bloggning, the posts can be about anything, high or low, 10 000 feet or up close an personal. When I started bloggning it was with that same feeling of letting other people know about this great new thing I discovered or how easy it was to set up a specific function, basically sharing is caring. So sharing comes first but when it leads to some sort of recognition it really makes blogging even more exciting. I’ve had the great fortune of being appointed as a VMware vExpert 8 times, I have to pinch myself to really understand and let that sink in. Wow, that’s amazing, all I ever wanted to do was to share some bits and pieces that was running through my mind. So I’m really blessed with the recognition I’ve already received but today is yet another good day. This morning when I woke up I saw an email from Corey Romero, responsible for the vExpert program over at VMware. Corey usually sends a few emails a week so nothing out of the ordinary at that point, but the subject got me really excited. It read “Welcome to the 2017 vExpert VSAN Program”. Jumping up and down with joy. It, at first, didn’t really sink in so I had to visit the announcement page to verify that my name was there…And yes it was. So I’m humbled, proud as can be and now I’m even more excited to leave for VMworld in just over a week. A great big “Thanks” to all the bloggers I ever followed, to VMware for the great products, again to VMware for having such a great recognition program in vExpert and to anyone that reads and promote blogs.